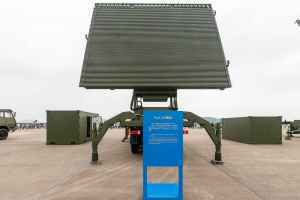 The YLC-2 radar is a 3-D air surveillance and acquisition radar that operates in L-Band. 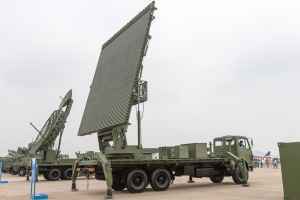 The radar uses a phased array with an aperture of 7 m · 9 m that scans electronically in elevation while rotating in azimuth. The original for this radar was possibly the AN/TPS-59, an assumption supported by many similarities in the construction of the antenna. The antenna array of the YLC-2 consists of many low-power radiating elements using solid-state power-amplifier modules mounted in 54 vertical rows. The main antenna is topped by an IFF/MSSR array. The YLC-2 radar has three display consoles and can track as many as 100 targets. 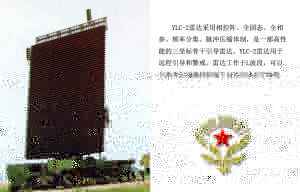 A total of 5 sets of YLC-2 radar systems were delivered to Pakistan from 2003 to 2004. YLC-2V radar is a mobile surveillance and medium/long range guidance S-Band radar that can be quickly deployed. It can provide comprehensive information including azimuth, range, altitude, IFF attribute, of large quantities of air targets. The antenna is smaller than the above origin, that results in lower resolution in elevation, but higher mobility (assembly/disassembly time: 40 min with 6 persons).